Construction remains relatively strong, but compared to the last few years it’s not booming. Currently it’s at a 4-5% increase over last year. Home prices are still moving upward because of short supply; not demand and this part of the equation needs to be watched. There is still some chatter of a looming sub-prime problem, let’s hope it’s unfounded. Commercial construction is doing well with some sectors (but fewer than last year) showing double-digit growth. Public construction is again stalled, but hopefully this will change soon due to the new administration’s infrastructure proposals. Despite some weaknesses, it’s still a good time to be in the construction industry. Some commodities (such as wood products and copper) are on the way up. Others are up slightly or completely flat. We are about to find out if the upcoming trade wars will affect construction materials. Inflation remains low although economists continue to hedge their bets. Oil and gas seem to be on a sustained roller coaster ride, and are very hard to predict. 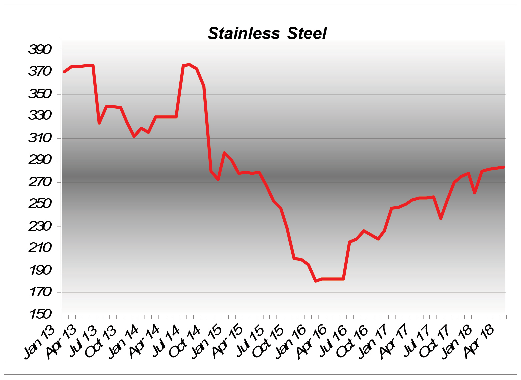 Stainless is up 11% for the year after an increase of 20% last year. Despite these back-to-back increases, it will be quite some time before we approach the values for stainless in 2013 or 2014. 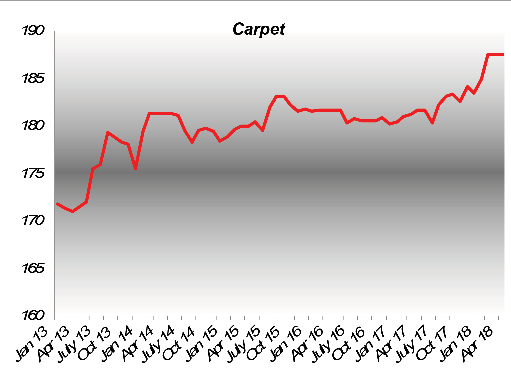 After trading in very tight ranges for the last five years, we are now seeing carpet gain 3-4% over last year. 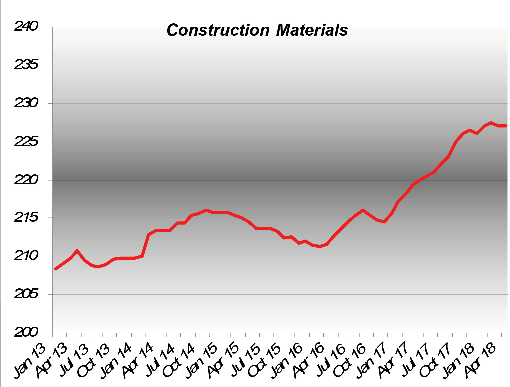 Carpet is now tracking to the fortunes of the construction industry, something that it hasn’t done for the last several years. This component is up 3-4% over the last year. 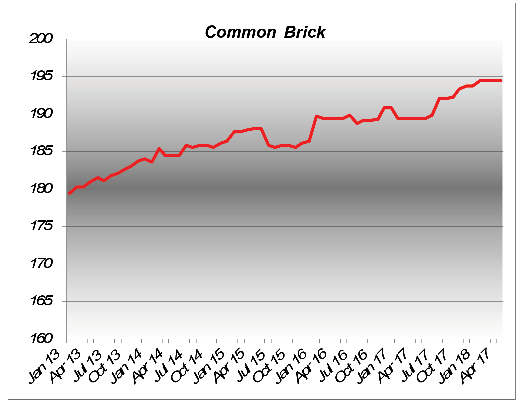 After 12 years, brick seems to have made a comeback and is finally approaching 2006 levels. Last year we thought that the price of paint may have flattened out. 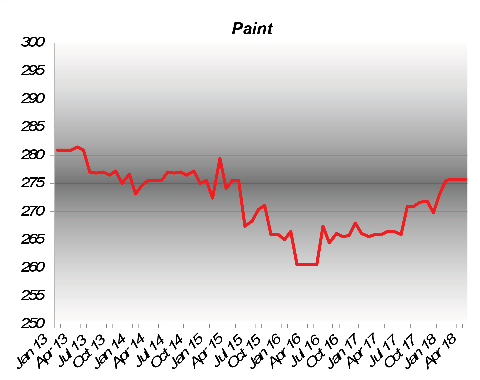 There didn’t seem to be any reason why the price was moderating, except that after large increases three years ago the market for paint might just have caught up with itself. That wasn’t the story this year and paint registered an increase of 3-4%. 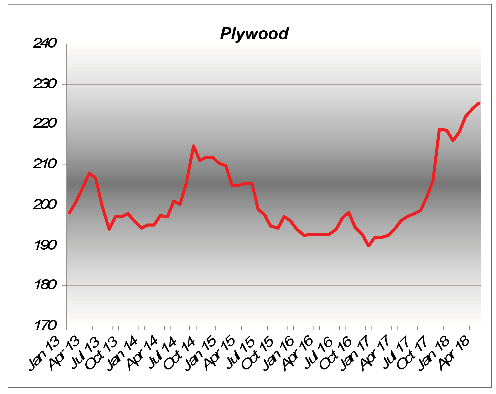 For the past three years we predicted that plywood would follow the gains of framing lumber, but that just didn’t happen. Now it’s finally catching up and showing gains of 15% for the year. It now looks like plywood and lumber seem to have gained their interdependence.